wooden gates gallery showcasing recent work undertaken for clients. If you need any assistance don't hesitate to contact us either by phone or e-mail. Situated in Buckinghamshire, we design, manufacture and install individual gates to customers requirements. Every gate is hand crafted by our skilled blacksmiths or joiners, then galvanised and painted or powder coated, wood preserved or painted to the highest standards. Whether you require a gate for your driveway, garden, entrance, estate or park we can accomodate your needs. 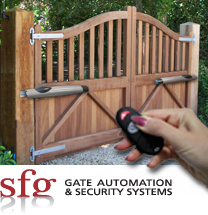 Our gates can have electronic controls fitted to enable automatic or keypad access, giving added security along with the ease of electric operation. We also produce railings, fences, security bars and grills. We also specialise in various Security Systems, please contact us for more details.